Computed tomography (CT scan) is a medical imaging procedure that utilizes computer-processed X-rays to produce ‘slices’ of specific areas of the body. These cross-sectional images are used for diagnostic and therapeutic purposes in various medical disciplines. Since its introduction in the 1970s, CT has become an important tool in medical imaging. 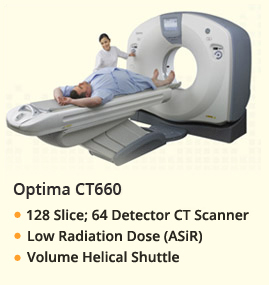 CT Scanning of the head is typically used to detect infarction, tumors, calcifications, and hemorrhage and bone trauma. CT can be used for detecting both acute and chronic changes in the lung parenchyma, that is, the internals of the lungs. It is particularly relevant here because normal two-dimensional X-rays do not show such defects. CT pulmonary angiogram (CTPA) is a medical diagnostic test used to diagnose pulmonary embolism (PE). It employs computed tomography and an iodine based contrast agent to obtain an image of the pulmonary arteries. CT is a sensitive method for diagnosis of abdominal diseases. It is used frequently to determine stage of cancer and to follow progress. It is also a useful test to investigate acute abdominal pain. An important issue within radiology today is how to reduce the radiation dose during CT examinations without compromising the image quality. Several methods that can reduce the exposure to ionizing radiation during a CT Scan exist. .
What causes these blocks in Coronary Arteries? The commonest cause of narrowing of coronary vessels is due to the deposition of fat in the vessel wall. Fat deposition in the coronary arteries is a natural process and starts at an early age, the progression and severity varies from person to person. Coronary Artery Disease (CAD) is the most common cause of sudden death. First symptom of heart attack comes when the deposits in coronary vessels obstruct the blood flow by more than 70%. Why early detection of Coronary Artery Disease is Important? Early detection is the “Mantra” for preventing heart attack. Proper treatment at an early stage will stop the progress of the disease & also can reverse the fat deposits. How can we detect it? What is Invasive Catheter Angiography? A tube will be inserted inside your body through a puncture in your leg artery. Serial X-ray pictures are taken after injecting iodine containing medicine into your heart vessels. The X-ray pictures can tell the status of the coronary vessels. This procedure is painful and requires admission. Does non-invasive CT Angiography give the same results as that of catheter coronary Angiogram? Non-invasive CT Angiography has 99% negative predictive value. Also, it has a very high specificity about the type of atherosclerotic plaques (deposits) and can differentiate them into calcified, soft and mixed types, which is not possible with catheter angiogram. Who should get their Coronary CT Angiography test done? High blood pressure more than 130/90 mm of Hg. How I prepare for my scan? 1. No food for at least 2-3 hours; Avoid coffee/smoking. 2. Take plenty of fluids. 3. Take all regular medicines, if any. 4. Bring all your previous medical records, especially your kidney function test. 5. Please come with an attendant. How long does it takes for coronary CT angiography? The actual scan takes less than 5 seconds. But, you need to be prepared for the scan, which takes 30 minutes to 1 hour. How Coronary CT Angiography is done? the CT table and an intravenous line will be inserted in to one of your arm veins. If your chest is hairy we need to shave over a little area of the chest, to fix the ECG leads. You will be given a tablet if necessary, to control your heart rate. You will be instructed to hold breath during scan. Your scan is done by CT equipment along with ECG gating. During the scan non-ionic contrast medicine will be injected through the arm vein, which may give you a slight warm sensation. What care should I take after the scan? No post scan care is recommended. You can return to your normal activities and consume food soon after the procedure.